Partnering is a key competence for building telco digital services offerings, but many past attempts have failed. So what does it take to succeed? In this briefing we review viable strategies, key success factors and barriers, and profile the highly effective approach used in AT&T’s Drive Ecosystem. As communications services providers continue their push to develop and monetise digital services, partnering is proving a critical element of strategy, and a key enabler for telco agility. While some telco-digital player partnerships have been successful in achieving their objectives, many have languished, and failed to deliver value to one or both parties within the partnership. In this report, we examine the different types of digital services partnerships that operators are engaged in; discuss the key success factors for the various partnering approaches and strategies; and look more deeply at a successful partnership strategy: AT&T’s Drive connected car initiative, which is an example of a broad vertical-focused partnership ecosystem. Our follow-on report will provide a case study of TeliaSonera’s successful digital music partnership with Spotify, an example of a single-focus collaboration for digital services. Telcos are increasingly recognising the importance of partnerships for achieving their potential as true digital services companies. Partnering between telcos and third parties to deliver new services or target new markets is, of course, not a new phenomenon. Two things are new, however: the focus on partnering as a core competency of the telco organisation, and the increasing complexity of telco partnership ecosystems, as digital services, enabling technologies and service delivery value chains continue to evolve. An agile approach to building and managing complex partnerships is one of the key elements of becoming a Telco 2.0 organisation. “The list of companies we have been working with for many years is long. But how we cooperate, that has changed. We are more open and faster. We focus on our core competence – our best net – and add specific offers of the partners. Take for example the eReader tolino: We not only provide the eReader, but also the technical platform on which Bertelsmann, Hugendubel, Thalia and Libri are able to distribute their eBooks. Together with the German book trade, we established the tolino as a model of success in the eReader market. The DTAG example highlights our second point about new aspects of partnering. The increasing complexity of digital services partnerships, and the growing trend for larger partnership ecosystems with many partners participating from different levels of the value chain, requires telcos to take a different and more flexible approach. A potential digital services partner will usually want to build global scale and so is likely to have several telco partners. Digital services partners will in many cases move at very different speeds from telcos in terms of decision-making and processes, and are likely to use a variety of distribution channels, some of which will bypass, or compete with, the telco partner (particularly for OTT B2C content services such as Spotify). For both B2B and B2C partnerships, business models and revenue sharing arrangements are likely to be fluid and to involve multiple parties. B2B (and B2B2C) services are increasingly being supported by more extensive and complex partnership ecosystems, rather than single partnerships. Telcos may lead the development of such ecosystems – as AT&T does in the case of Drive – or simply participate. The growth of wider ecosystem partnering relationships has been especially prevalent in the development of M2M/IoT propositions. These may require a variety of platforms, applications, devices and integration elements, as well as a high level of openness in terms of open-source and accessible platforms, APIs, analytics etc. These trends present challenges for traditional telco approaches to partnering, which have favoured exclusive relationships and ‘what’s-in-it-for-me’ approaches to building joint revenue streams. Many telcos have set up digital or innovation arms with the goal of developing new digital propositions together with third parties in a more flexible manner. However, for such propositions to succeed, they need clear buy-in from one or more of the main divisions of the telco. In the case of AT&T, the successful partnering effort we profile here was ultimately rolled back into a main division of the operator, rather than continuing to sit within an innovation division. Based on our observations from AT&T’s success and the partnership case study we cover in our follow-up report (TeliaSonera’s long-term relationship with Spotify), we have identified a set of key success factors, and major barriers, for effective digital services partnerships between operators and third parties (see Figure 2). 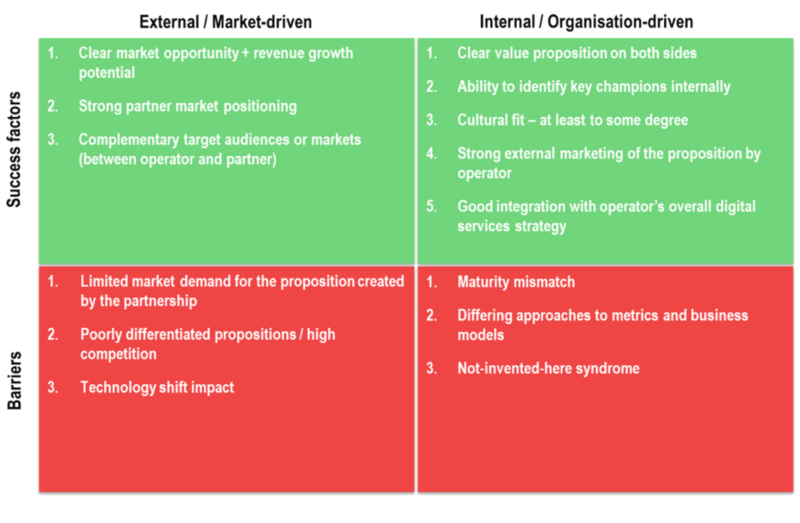 While it isn’t the case that all of the key success factors above must be present in successful operator partnering initiatives, our analysis suggests that several external and internal ones should be present in any digital services partnership. In the next section, we discuss drivers for digital services partnering, approaches operators have used in partnering, key success factors and barriers; and evaluate the approach that AT&T has taken to partnering with the connected car. There are several compelling reasons for telcos to partner when exploring and growing digital services opportunities. The most important of these drivers are shown below in Figure 3. Each driver supports a set of higher-level objectives for telcos, comprising revenue growth, revenue retention, branding and positioning, and organisation transformation and/or agility. Drivers linked to the objectives of revenue growth and retention may appear to be most compelling to telcos, given their obvious short-term impact; but those linked to transformation/agility and branding/positioning have been at the forefront of the AT&T partnership initiative we profile here as well as the TeliaSonera-Spotify partnership we profile in our follow-on report. The most successful partnerships support several telco objectives: part of their success is thus attributable to the support they engender from across the telco organisation. As discussed in the following sections, beyond clearly defining the objectives of the partnership, and the assets that both parties bring to the table, there are a number of other soft elements that contribute to (or hinder) the success of telco digital services partnerships. The existence of clear market demand for the partnership’s products and services is also a key, though sometimes overlooked, element of success.